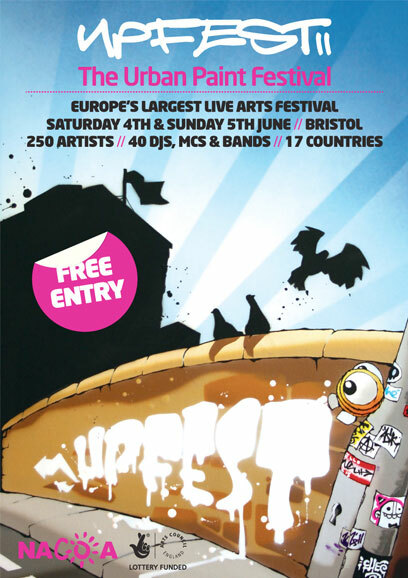 Europe’s largest free urban paint festival; Upfest, is now in its fourth year and is preparing to take over its cultural home Bristol by welcoming over 250 artists and 40 DJs, Groups & Human Beatboxers to the event this summer between 4th and 5th June 2011. ‘The Urban Paint Festival’ is now firmly established as the main event for street art in Europe. The two day explosion of events attracts urban artists from all over the world who flock to The Tobacco Factory – the festival’s birthplace, as well as a number of locations across the city. Big names in national street art culture Don, Inkie and Spqr set up their temporary home alongside home grown talents Cheo, Jody and Lokey. The festival helps raise funds and more importantly awareness for the Bristol based charity NACOA who work to address the problems children have growing up in families where one or both parents suffer from alcoholism. Upfest is a completely volunteer led festival and has so far raised £15,000 for the charity.